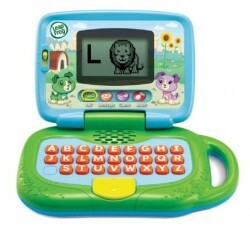 The bestselling laptop for 2 year old girls and boys is the My Own Leaptop. Labelled as a toy learning laptop for 2 year old children up to 4 years, this is a good gift for now that will last several years. It has a choice of a programs that 2 year olds can easily switch between. Some of the programs, such as the music and letters games, are simple enough for very young children to understand. At this level, the Leaptop helps pre-school children to learn about cause and effect as they can press the mouse (“paw pad”) to make the music play. Other programs, such as the alphabet game, are more complicated as the child has to press the letter corresponding to the name of the animal on the screen. This is great as it makes this a learning laptop for 2 year olds that can genuinely grow with them. I know several 4 year olds who still play with their LeapTop. In fact my daughter Sophia saw me writing this post and immediately asked to play on her own Leaptop! She loves playing the alphabet game and dancing along to the music game by copying the little dog’s movements (wagging her bum when he wags his tail!). The My Own LeapTop has a bigger screen than most toy laptops for 2 year olds, making it easier to see the animations. It has 26 fun animal animations, a pretend email program, a carry handle and is fairly indestructible – an important feature in any laptop for 2 year olds! It can even be customised to help the child learn how to spell their own name. If you’re into the wider online LeapFrog Learning Path then you can use this toy laptop as part of a suite of other toys. 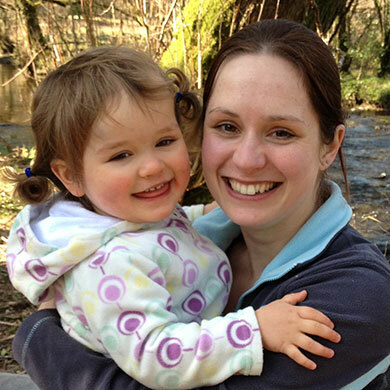 This allows you to create customised learning, expanding your 2 year old’s learning. With so much packed into a single toy, I think this is definitely joint best laptop for 2 year old children. 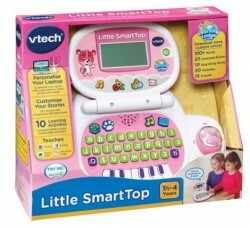 The VTech Little SmartTop is another big player in the laptops for 2 year olds category. In many ways it is very similar to the My Own LeapTop, and it has many of the same benefits. This kids’ laptop is centered around a cute bear character – Cody the Smart Cub – who guides children through a choice of 11 fun activities. There’s a nice range of programs which teach 2 year olds the alphabet, numbers, shapes and music sounds. Like LeapFrog’s My Own Leaptop, VTech’s laptop for children has an A-Z keyboard which helps children to learn their letters. They can press a letter to hear it read out loud by Cody the Smart Cub, and also see objects that begin with that letters. As an added bonus, you can connect the VTech Little SmartTop to the Learning Lodge website. This allows you to enhance the toy laptop by downloading various things such as stories and ecards. Sofia The First toys are very popular with 2 year old girls. 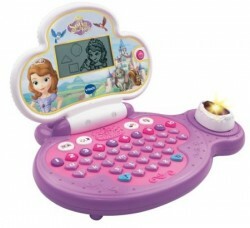 The Sofia The First Royal Learning Laptop is one of the best laptops for 2 year olds at the moment. This toy laptop is perfect for toddlers who want to be a princess. It has plenty of princess features such as light-up mouse shaped like a jewel, pretty drawings and animations. It’s shaped in a more princessy way than other laptops for 2 year olds, but it is a robust and chunky design with a carry handle. This is an educational learning laptop like the other toy computers featured in this article. It helps 2 year olds to learn letters, phonics, whole words, numbers and shapes. It also packs in some extra learning areas which the other toy laptops don’t cover such as logic, memory and manners. In total there are 12 learning games divided into 4 modes: language, maths, logic and music. The music mode includes 10 cute tunes and there are also plenty of sound effects and the voice of Sophia the First. I haven’t marked this as the best laptop for 2 year old children because it’s strongly aimed at girls. The fact that it is merchandise from a TV program also prevents it from being ageless in the same way as the My Own LeapTop and VTech Little SmartTop. If you want to pass it on to your next child or other friends and family then this may mean that it appeals to fewer children overall. However Sofia the first is really popular at the momen. Even after it stops being popular, I’m sure that 2 year old girls will continue to love this toy laptop. Being a Peppa Pig toy, the Peppa Pig My First Laptop is a very popular learning laptop for 2 year olds and will appeal to boys and girls alike. This is a much more basic toy laptop than the My Own LeapTop and VTech Little SmartTop featured above. It therefore won’t appeal as well to 3 and 4 year olds, but there’s plenty packed into the laptop to entertain a 2 year old. 2 year olds can press the buttons to learn colour recognition, quantities, letters, quantities, facial expressions and emotions as well as shapes and objects. The ‘screen’ is much more basic – consisting of a picture of Peppa and George at home. However it does the job, enhanced by the fun noises and sounds. The Peppa Pig toy laptop has 4 programs, each one introducing 2 year olds to a different part of Peppa Pig and George’s world. This includes discovery games, music and quizzes which encourage the child to push the buttons to answer the easy questions. Like other laptops for 2 year olds, the Peppa Pig computer has a chunky handle which makes it fun to carry around. 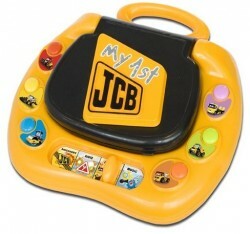 A lot of people say that the Inspiration Works JCB My First Laptop is the best laptop for 2 year old boys, although plenty of girls like it too. The toy learning laptop teaches 2 year olds and slightly older children about shapes, colours and numbers. Although it doesn’t have a proper screen, the 6 backlit sections represent different objects and each have a colour, shape or quantity. 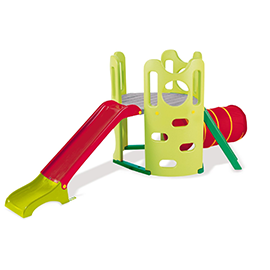 There are 4 game modes which are selected with a slider which is a suitable size for 2 year old fingers. These are discovery, quiz 1, quiz 2 and music. The music mode has 2 musical keys and sound effects. This is a nice first laptop for 2 year olds, but it’s nothing special. In my opinion it’s definitely not the best laptop for 2 year old children, but it may still be a good buy for boys who love diggers and JCB’s. Yes, the JCB branding is a gimmick – however if that’s what inspires a child to learn then that’s not necessarily a bad thing. 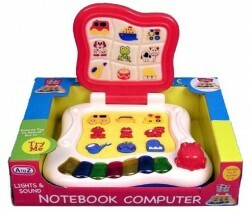 The Try Me Notebook Computer is seen as one of the best learning laptops for young 2 year olds who may not be ready for a proper first computer. 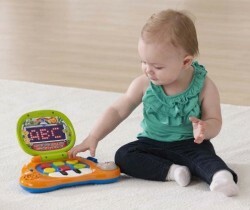 It’s labelled as being a toy laptop for 18 months upwards and is suitable for a slightly younger age group. This is reflected in the fact that it is simpler to use than the My Own LeapTop and VTech Little SmartTop. It probably won’t appeal to a child for as long as the more advanced models, but it’s popular with 2 year olds and will last until they’re at least 3 years old. This educational laptop features lights, sounds, cute animal pictures and musical notes which are just the right size for 2 year olds to press. It doesn’t have a proper screen like some toy laptops and it doesn’t have multiple modes to choose from, but 2 year olds will enjoy experimenting and seeing what happens when they press the different keys and buttons. The keyboard is a nice touch that you don’t find on most kids laptops, and means that it doubles as a musical toy. The Fireman Sam My First Laptop is perfect for any 2 year old who likes Fireman Sam. 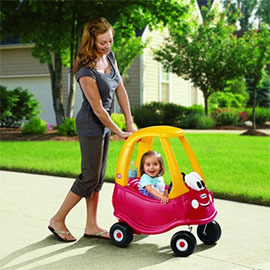 Suitable for children from 18 months up to about 3 years old, it has plenty to keep a toddler entertained. 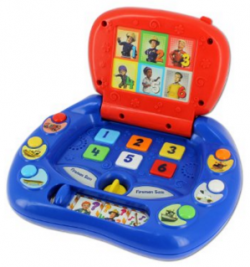 This toy laptop is – obviously – heavily themed around Fireman Sam. Like other laptops for 2 year olds, it has multiple game modes which teach things like numbers, and it has music, lights and sound effects. However it’s a bit more interesting because the activities follow Fireman Sam on his missions, linking it to the TV program. The Fireman Sam toy laptop is a nice chunky shape and quite robust, and is easy for children to open, close and carry around with them. 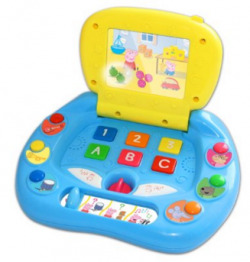 The Vtech Baby’s Light-Up Laptop is well suited to the younger end of the 2 year old market. While this toy laptop doesn’t have a proper screen, the screen does light up when you press the different buttons. It helps 2 year olds about numbers, letters and shapes. There are 6 shape buttons and 3 piano keys, so it doubles as a musical toy. It even teaches Spanish words as well as English, which is something you won’t find in other laptops for 2 year olds! The mouse moves in 8 directions which is better than the static mouse on other toy laptops. The Vtech Bear’s Baby Laptop is a cute laptop for 2 year olds because of its bear shape, which makes it more cuddly looking. As you might expect, it’s much more basic than the My Own LeapTop and VTech Little SmartTop and is aimed at 1, 2 and 3 year olds. 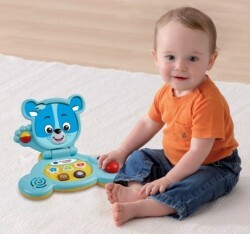 Like the Little SmartTop, this toy laptop features Cody the Smart Cub characters – but at a much more basic level. Overall this laptop isn’t bad – the mouse moves in 4 directions and mimics a real mouse more effectively than most toy laptops. The paw moves like a roller ball which is another nice touch that makes it more like a real computer. There are 2 light-up buttons that you can press to identify objects, 5 shape buttons and the numbers 1-3. It also plays child-friendly songs when you press the buttons, and you can play peek-a-boo with the bear by opening and closing the lid. However it’s just so basic that I think this will really only appeal to very young children. It has less ability to grow with the child than the other laptops in this list. Instead, I would go for a toy laptop that will appeal to young children and can be used in more advanced ways as they progress – which isn’t an option with the Vtech Bear’s Baby Laptop. The WinFun Busy Froggy Laptop is a good choice of toy laptop if you’re looking for a basic, simple and cheap option. It can’t compete with the more advanced toy laptops in this list, but it doesn’t try to – it has a completely different purpose. This toy is also smaller than the other laptops for 2 year olds, so if you’re planning a journey then it will be good as a travel toy. The frog laptop features flashing lights, 3 modes of play including learning and music mode, and it helps babies and young children – up to about age 2 – learn the alphabet, basic numbers and shapes. It has several fun sound effects and songs. 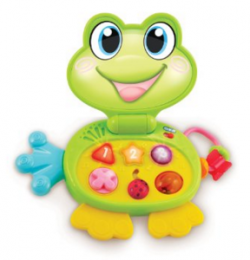 The frog’s head doubles as the lid, and toddlers will enjoy opening and shutting it in a game of peek-a-boo. It also has pretend cursor buttons, a sliding beetle and sliding rings on the side. Amazon says that this toy laptop is suitable from 12 months up to 18 years. This is a bit of a joke (probably a typo!) 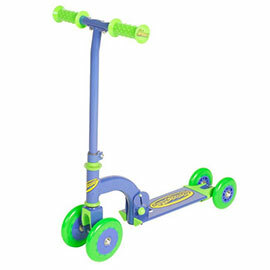 but I would say that it’s suitable for up to 2 year olds – probably no older than this.